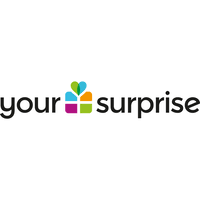 Find here the best YourSurprise coupons and vouchers. What started with personalised songs in an attic room has grown into the largest online gift shop for personalised gifts. With an assortment of over 1500 gifts, customers can always find a great surprise for any occasion. Personalised books, engraved glasses, kitchen gifts, baby- and children’s gifts.. just a few examples of the YourSurprise gift assortment. Our gifts are very easy to personalise with a photo and personal text. In just a few clicks, the customer can design a unique gift for a birthday, anniversary, special holiday such as Valentine’s Day, Mother’s Day, Father’s Day or Christmas, or as a thank you. Made with love, always! Order before 16:00 (CET), shipped today!